The African lion (Panthera leo) is the most socially inclined of all the wild felids, generally choosing to live in groups called prides. The pride typically consists of five or six related females, their cubs of both sexes, and one or two males. The males will mate with the adult females, but male cubs are excluded from their maternal pride when they reach maturity. These predatory carnivores are iconic for their ferocity, bravery and strength. However, as with cats of any size, they can occasionally show a playful side. 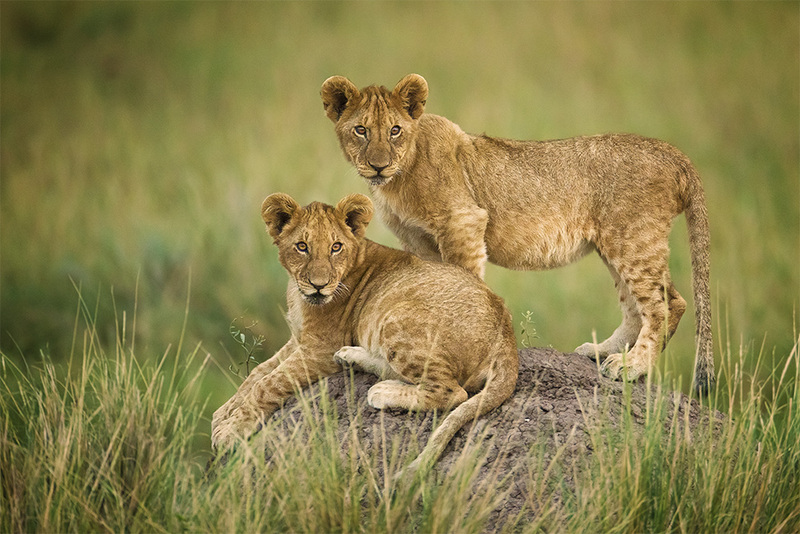 In this photograph, two young lion cubs, future kings of the jungle, play atop a rock in the tall green savannah grasslands in the Masai Mara, in Kenya, Africa.